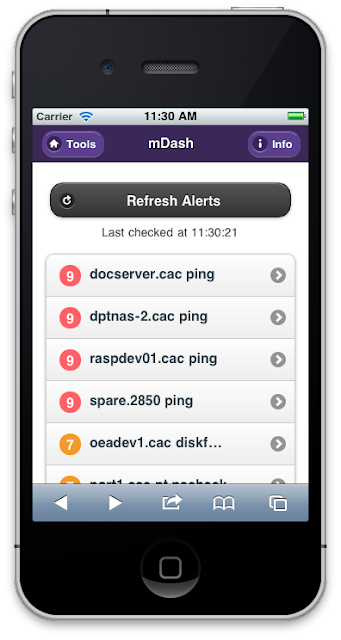 We've written Mobile Dash, or mDash, a mobile web app for monitoring UW-IT system alerts. The interface uses jQuery Mobile. Behind the scenes, mDash uses jQuery for its Ajax call and DOM manipulation. It also uses Badgerfishjs to transform the alerts from our XML web service into JSON. And some custom CSS adds UW colors to the interface. So what is mDash? It's the mobile version Dash. But what's Dash? Dash is UW-IT's Java Web Start (Swing) application for monitoring system alerts. One description reads that, "It is intended to be [a] simple and reliable way for system engineers, computer operations, client support groups, and management to view DSUE system status." (DSUE being Distributed Systems and Unix Engineering). By system we mean all sorts of systems. Dash monitors everything from web services used by a handful of developers to student email servers. Our team's goal with mDash was to replicate a subset of Dash's functionality in mobile web app form. We wanted to: show what's down (an abbreviation of the hostname), indicate the severity of the problem (the color-coded numbers adopted from the Java app), and allow a person to view a few more essential details via an alert detail page. When monitoring critical systems, freshness of information matters. So, on the home page we display the time when alerts were last checked and we provide an unavoidable "Refresh Alerts" button so people can retrieve the latest alerts when they want. In the future we may refresh the alerts asynchronously, but due to the large amount of alerts that asynchronous process can slow some devices' browsers to a crawl or bring them to a standstill. The alert detail page's fields might seem esoteric to people outside DSUE at UW-IT, but these labels are familiar to the smallish set of people who will use this app at the outset. As mDash (and Dash) moves toward wider adoption, we'll need more human-friendly field labels. It will sound clichéd, but mDash was fun to make. And jQuery Mobile is what made it fun. We did run into some funky bugs and behaviors along the way, but never insurmountable ones and never ones that the jQuery Mobile community hadn't already solved. To say we're looking forward to making another jQuery Mobile web app is understating it.